Spare room ideas from our fans, Just yesterday, we posted a blog about the things you can turn your spare room into. Hours later, emails and messages came flooding in from dozens of our readers sharing their own ideas. So, we thought why not compile all the most popular ideas and put them in one post? Here are some of the best we’ve got from all of you. A home theatre – if movies are you and your family’s thing, then this is the best idea. We have several emails asking if it is possible to turn a spare room into a personal theatre. The answer is yes. You could use one wall for the screen, a good surround system and you are good to go. You can even set up sofas, or just turn the whole floor into a wide bed so everybody can pile in. The home theatre doesn’t need to be luxurious. It can be just comfortable and cozy for everyone. A cloakroom – some families are quite fond of the outdoors. A cloakroom is a place where you can store all of our outdoors stuff. Dog’s room – or any pet, for that matter. Make sure there’s at least one window. It is a bit of a luxury, yes. But if you can afford it, why not? A play room – how is parenthood going? A mini play-room with ball pits, stuffed toys and maybe even small slides is a bright idea. You can even have a cheeky go in the play room ball pit when your kids go to bed. Admit it, you want to try it at least once. 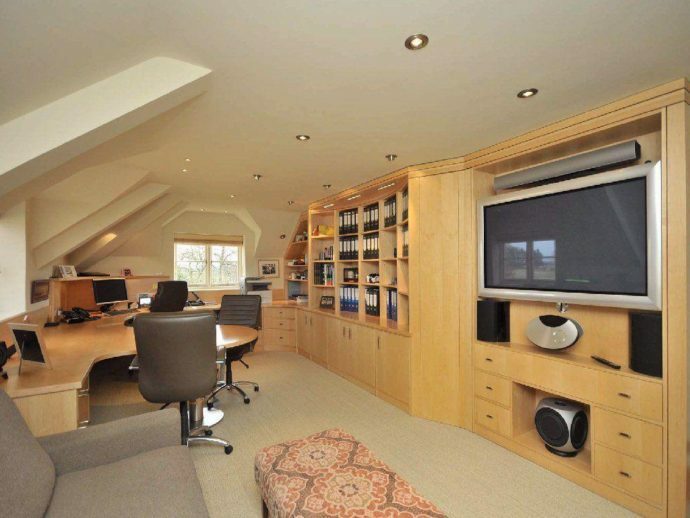 A home office – this is for those who work at home, or have the privileged option to do so. You can work from home and get so much done. Just imagine going to work minus all of the hectic commute and traffic. That sounds absolutely perfect, right? Your own bar – hey, it can be done. A counter, a rack of bottles and a few good seats should do the trick. You can even mix your own cocktails, shake up a martini or decant your favorite bottle of red. How’s that for a perfect Friday evening?